In 1879, The Journal of the Transactions of the Victoria Institute dedicated its thirteenth issue to the question of the “Antiquity of Man,” publishing a year's worth of papers and arguments in one fell swoop. This publication included a paper by John Eliot Howard (F.R.S.) presented 3 February 1879, describing the results of his investigation of the geology and archaeology from Kent’s Cavern, South Devon – contributing archaeological evidence to the hotly contested question of Man's Antiquity in England. I stumbled upon the 1879 Journal of Transactions thanks to Trevor Shaw’s catalog, Cave Illustrations Before 1900: A Catalogue of Non-Photographic Illustrations of Caves, published by the British Speleological Association. In thumbing through the catalog, the section on “imaginary caves” caught my attention. The “imaginary caves” indicated both fictional caves ( e.g. L.T. Meade’s Cave Perilous in children’s lit), but it also included caves that depicted reconstructions of long-extinct taxa. A brilliant, fantastic, and unexpected catalog. Mr. Howard is nothing if not descriptive regarding his study of Kent’s Cavern in Devon – waxing rather eloquent (long-winded?) about the speleothems and the process of their formation. The fauna, however, was another matter. The descriptions are short and the imagination large. Especially, should we desire information respecting one animal, the Machairodus latidens (Owen), a large lion-like animal, armed with double-edged teeth, in shape like the blade of a sabre and with two serrated edges. This formidable creature seems to belong rather to the pleiocene [sic] than to the pleistocene [sic] age, and its remains are exceedingly rare, but were found by McEnery in the cave, giving rise to considerable controversy. This considerable controversy revolved around what kind of animal this Machairodus latidens was, how to reconstruct it, and what it might have looked like bludgeoning its way across the landscape. Originally, described as “bear-like” (known as Ursus cultridens, prior to 1871) it was later assigned “lion-like” qualities and eventually the fossils were taxonomically settled as Homotherium latidens. For John Howard, however, they were simply Machairodus – and they was fantastic. Sadly, the scan from Interlibrary Loan was a bit distorted from the 1879 article. But the Bear-Lion-Slinky Mammal (with the mammoths in the background) provides a great sense of the imagined Pleistocene drama. This taxonomic controversy of how to reconstruct an animal – ursid? feline? – based only on these recovered teeth is evident in the illustration that accompanied Mr. Howard’s article where we see the lion-bear-slinky mammal wrecking havoc across the rather Titan-esque Pleistocene landscape. John Eliot Howard. 1879. “The Caves of South Devon and Their Teachings.” Journal of the Transactions of the Victoria Institute 13: 163–80. Lundberg, Joyce, and Donald A. McFarlane. 2007. “Pleistocene Depositional History in a Periglacial Terrane: A 500 K.y. Record from Kents Cavern, Devon, United Kingdom.” Geosphere 3 (4): 199–219. doi:10.1130/GES00085.1. McFarlane, Donald A., and Joyce Lundberg. 2013. “On the Occurrence of the Scimitar-Toothed Cat, Homotherium Latidens (Carnivora; Felidae), at Kents Cavern, England.” Journal of Archaeological Science 40 (4): 1629–35. doi:10.1016/j.jas.2012.10.032. Pengelly, Wm. 1871. “The Alleged Occurrence of Machairodus Latidens in Kent’s Cavern, Torquay.” Geological Magazine 8 (79): 42–43. doi:10.1017/S0016756800160959. This is one of the most interesting snippets of paleo-connections that I’ve come across in my research for Famous Fossils, Hidden Histories. 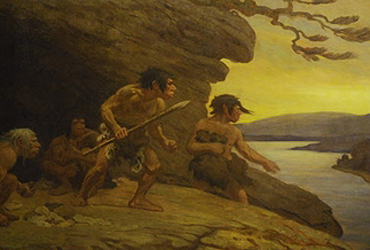 Celebrated artist, Charles Knight, meets prominent paleoanthropologist, Dr. Robert Broom. When Dr. Robert Broom, the renowned paleontologist, arrived in New York from the Transvaal Museum in Pretoria, South Africa, I was allowed to sit between him and Toppy [Charles K. Knight] in a large limousine, as my grandfather accompanied Broom to a radio studio. Broom was then in his eighties, making his first trip to the United States. He later wrote to me from Africa with an invitation for Toppy and me to visit him. Sadly, my parents felt that I was too young at five to travel to the other side of the world without them. Was I angry!